As with all tourist destinations the world over, the more organised the attractions of the country are, the better they are able to attract the greatest number of visitors through more effective marketing. In South Africa, this means cities like Cape Town draw far more overseas visitors than the city of Durban, and the Wetlands of St. Lucia draw many more visitors than the stunning hamlets along the Wild Coast of the Eastern Cape, both being equally remote. This is not to say that Durban or the Wild Coast does not offer great value for money – they do, and much of it – but more often than not, lower budget constraints for marketing result in fewer search hits when holidaymakers plan their next trip. To start with South Africa’s most popular tourist destination, the old Kruger National Park sees the majority of its visitors pack themselves into the southern section of the park, into the large camps of Skukuza with their attractive shops and restaurants. While the animal life is more plentiful down south, the north is brilliant, vast, and also populated with all the fascinations of nature. Next time you head for the Kruger, spend your evenings at the camps of Letaba and Shingwedzi, and even Punda Maria, where you will be more in touch with nature and less in touch with holidaymakers. While Cape Town is a great city, Durban, comfortably situated on the warm Indian Ocean coastline, has had a bad rap over the past two decades. It used to be the holiday mecca for white South Africans in the old days, but it has fallen out of favour with this group as the cultural complexion of the city became more African. Durban is experiencing a rejuvenation. You will be amazed at the cleanliness of the city and its streets, and the fabulous development along the Golden Mile, with endless jogging and cycling paths from the Moses Mabhida stadium down to Ushaka in the south. The promenade restaurants too are vibrant, and the grand old hotels, like the Maharani, are all still there, offering great value and good service. 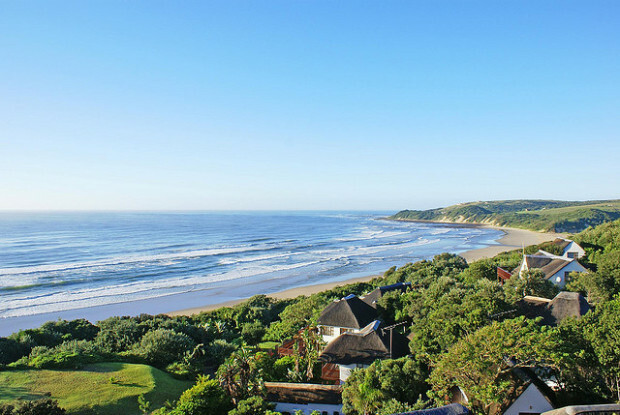 The former Transkei area of the Eastern Cape, along the Wild Coast of South Africa, has long been a generally ignored area by the country’s mainstream holidaymakers, and this should not be so. The area is extremely rich in brilliant nature, from cliffs and beaches to forests and falls. There are some great little hamlets along the coast that offer incredibly warm and personal hospitality. The activities that are on offer are endless for families or couples, from horse trails and hikes to fishing and dining, sunning, and enjoying the traditional smiles and comforts of the Xhosa people. The Waterberg region a couple of hours drive north of Johannesburg is also an amazing holiday destination of peace and tranquillity if you are in that get-back-to-nature mood. The natural geography makes you feel as though you are new on the planet, as it is truly untouched and oozes eons of age. The rocky outcrops are amazing, and the small rivers are truly great to paddle in a canoe or laze on the rocks with a cold drink. You are remote and, depending on your catering requirement, can really hit base camp and not get back into your car for the next week, bringing all your living requirements with you and living ‘out in the sticks’ if you will. These are just some of the road less travelled areas of an already popular tourist destination that you might wish to explore on your next holiday excursion. If you’re located in South Africa, find a holiday home for cheap or a travel buddy on Gumtree today. There you have it, 7 destinations in South Africa beyond the obvious ones! Posted in Destination, Inspiration, South Africa and tagged with Africa, Beaches, Holiday, South Africa, Vacation. RSS 2.0 feed. South Africa is always one of the best places in the world for travelling. I think Cape Town is a great city in South Africa, perfectly located on the warm Native indian Sea shoreline, has had a bad rap over the past two years. Thanks for sharing.